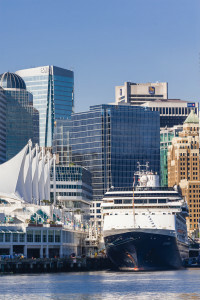 The international award-winning Canada Place cruise terminal is centrally located in downtown Vancouver near shopping, restaurants, entertainment, attractions and world-famous Stanley Park. The unique multipurpose facility is also conveniently based just 30 minutes from the Vancouver International Airport (YVR). 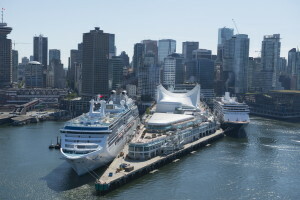 Canada Place’s distinctive white sail design, five-star Pan Pacific Hotel Vancouver, and premier attraction FlyOver Canada, make Canada Place an attractive start and finish to any cruise experience. Checking baggage is the first step of the boarding process. 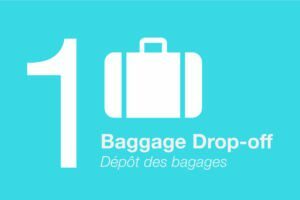 Baggage can be checked upon arrival at the cruise terminal, starting between 10:00 a.m. to 10:30 a.m. Pacific Standard Time (PST), for direct delivery to your cabin. When checking your baggage, please clearly indicate which vessel you are sailing on and ensure that your passports and medication are not packed in your checked baggage. 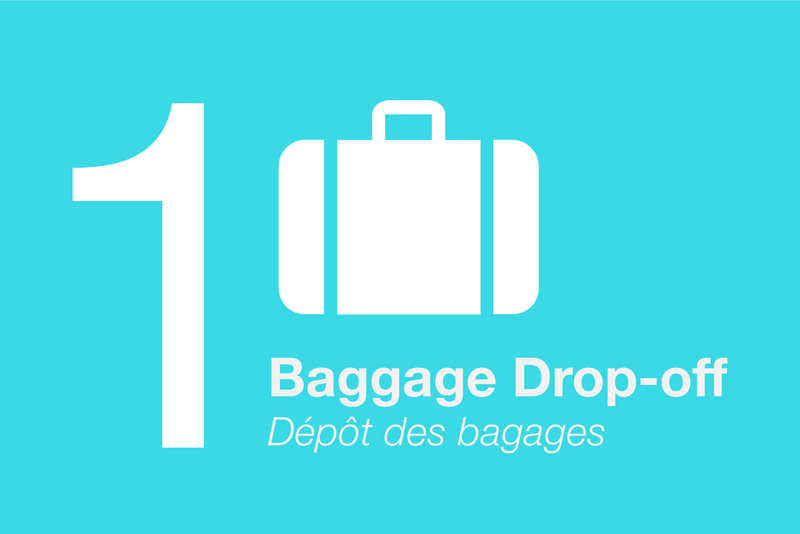 Upon disembarkation, baggage can be claimed in the baggage area in the cruise terminal. Check-in is the next step of the boarding process. Once your baggage is checked, cruise line staff will direct you up a set of escalators or an elevator to the cruise line check-in area, which is located one level up from the cruise terminal in Convention Centre Hall C. Once in the check-in area, passengers will be asked to complete a health questionnaire and cruise line staff will verify identification and boarding information and provide each passenger with a boarding card as part of the check-in process. Once passengers are ready to board, you must go through passenger screening, which is located on the cruise ship terminal level. Cruise line staff will direct you down a set of escalators or an elevator to reach the passenger screening area. At this point, passengers are required to provide attendants with your cruise ticket and identification. As passengers embarking in Vancouver are considered to be entering U.S. jurisdiction once they board the cruise ship, you will go through U.S. Customs and Border Protection immediately following the passenger screening process. Ten BorderXpress Automated Passport Control (APC) kiosks are available for use by eligible US and Canadian passengers at the Canada Place cruise terminal with the goal of improving passenger experience. US Customs and Border protection is the final step before boarding your vessel. Passengers who are disembarking in Vancouver are required to complete a declaration card and clear Canadian customs through Canada Border Services Agency. For those being picked up, the private car pick up location is different from the private car drop-off location. Please see passenger pick up for more information. Upon arrival at the Canada Place cruise terminal, mobility scooter and wheelchair rentals are available from Scootaround. To pre-book a rental, contact Scootaround, phone 1-888-441-7575. See the frequently asked questions page, for information on how to locate missing items. I-5 becomes BC-99. Continue north on BC-99 until you cross the Oak Street Bridge. Contact TransLink for public transit schedules and route planning. The Canada Place cruise terminal is serviced by regular shuttles and buses to major destinations, as well as city taxis, car rental companies, limousines and public transit. Booking transportation reservations in advance is recommended. Conveniently located at the Canada Place cruise terminal, the ground transportation desk operated by WESTCOAST Sightseeing offers visitors transfers to the Vancouver International Airport and all airport hotels, as well as private transfers or sightseeing tours. Regular shuttle service to the Canada Place cruise terminal is provided to and from the airport as well as Richmond hotels. WESTCOAST Sightseeing can also arrange bus service from Vancouver to Bellingham, Washington, Seattle, Washington’s SeaTac airport and to Victoria, British Columbia. WESTCOAST Sightseeing offers daily sightseeing tours in and around Vancouver, to Victoria and Whistler, as well as Hop-On, Hop-Off Sightseeing throughout downtown Vancouver, picking up right at the Canada Place cruise terminal. Contact the WESTCOAST Sightseeing reservation centre for more information, phone 1.877.451.1777 or email [email protected]ghtseeing.com. Rental car kiosks are on-site at the cruise terminal. It is highly recommended passengers arrange pick-up or drop-off with the rental company in advance of travel. The Canada Place cruise terminal is conveniently located adjacent to the public transport system at Waterfront station, which is serviced by Skytrain rapid transit, buses, the SeaBus (to North Vancouver) and the West Coast Express commuter train. 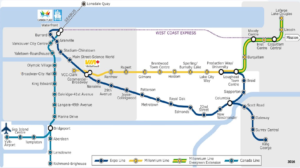 Skytrain’s Canada Line provides rapid transit directly to Vancouver International Airport. A limited number of limousines are available on-site. Please make arrangements directly with limousine companies for confirmed pick-up and drop-off. Contact WESTCOAST Sightseeing for further assistance or a Port of Vancouver traffic attendant at the limousine booth. The Vancouver International Airport (YVR) hosts 55 international and regional air carriers, servicing 125 destinations around the world. Vancouver city centre is approximately 30 minutes from the airport. Local flights to a variety of destinations, including Vancouver Island and Whistler, are available from the heliport or seaplane base adjacent to Canada Place. Shuttles, taxis and limousines and public transportation are readily available to transport passengers to and from the cruise terminal. Enter Canada Place cruise ship terminal via the vehicle ramp which is accessed off the foot of Howe Street. A Port of Vancouver traffic attendant will greet you and provide instructions near the top of the ramp. Proceed down the ramp, keeping to the left lane, into the parkade and take a ticket from the dispenser. If the pick-up is completed within 15 minutes, parking is free. Park on level P1 or P2. To access the cruise terminal, red elevators are clearly marked with the cruise ship symbol and located near the center and the west side of the parkade. Take the elevator to the passenger greeting area located in the main lobby on the cruise ship terminal level of Canada Place. Follow the signs to the green zone (P1 Level) which is for IMMEDIATE passenger loading ONLY. Green signage, lines and stalls indicate the green zone. Pull through into the green striped lane for immediate pick up. Passengers must be waiting in the adjacent writing area. If they are not within the area, please park close to the red elevator and follow instructions 5 & 6 from above. Vehicles left unattended in the green zone will be towed at the owner’s expense. Please leave the green zone as quickly as possible to be entitled to 15 minutes of free parking. Please note that parking fees apply after the first 15 minutes. Enter Canada Place cruise terminal vehicle ramp, accessed from the foot of Howe Street, and proceed to a Port of Vancouver traffic attendant. Receive passenger drop-off instructions from traffic attendant. Proceed to the designated drop-off location and work with the traffic attendant to back your vehicle into a designated drop-off space. At that time, your baggage will then be collected by baggage collection staff. When checking your baggage, please clearly indicate which vessel you are sailing on and ensure that your passports and medication are not packed in your checked baggage. Convenient long-term parking is available at Canada Place for regular height vehicles only. Maximum height is 6’9″. WestPark may be able to provide options for over-height vehicles at other off-site locations. Contact WestPark guest services directly for more information, local phone 604.669.7275 or toll-free long-distance phone 1.800.469.4169. Canada Place has short-term parking available for picking up and dropping off cruise passengers. Like the arrivals and departures areas of an airport, drop-off and pick-up areas are based in different locations at the cruise terminal. Short-term parking in the Canada Place parkade is free for vehicles not exceeding 15 minutes.